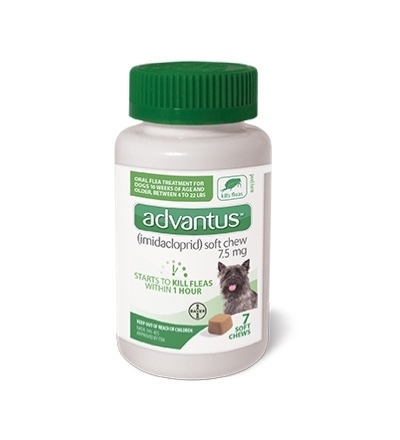 advantus® is an FDA-approved, flavored soft chew that fights fleas fast. It starts killing adult fleas on dogs within 1 hour. advantus® is safe to dose daily as needed and can be a helpful tool for in-clinic treatment for dogs in need of a fast-acting flea knockdown. Because advantus® does not contain any animal proteins, it's suitable for dogs with animal protein food allergies. It can also be used along with heartworm preventatives, dewormers, antibiotics and shampoos and is indicated for use in dogs and puppies 10 weeks of age and older and weighing 4 pounds or greater.